Hello Friends! I’m excited to share with you a bit about my new collection, Sunnyside Up. 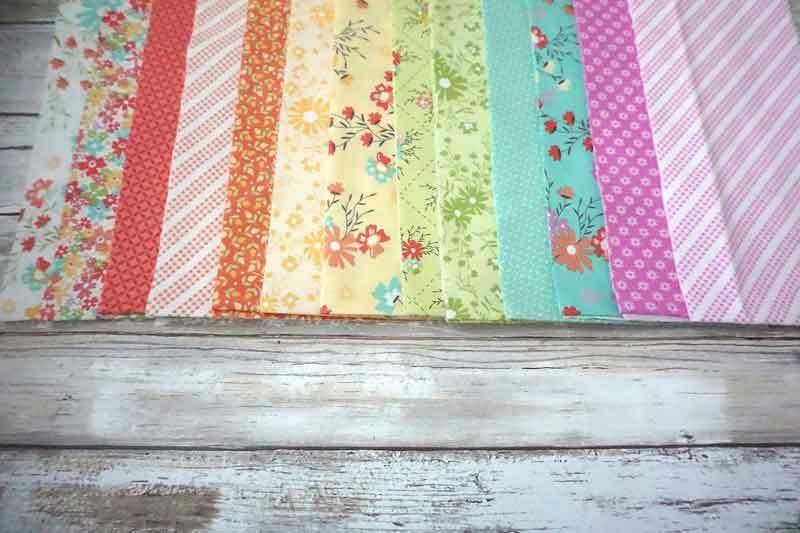 I also love when I can mix and match lines because I love a scrappy quilt. Sunnyside Up features a palette that will pair very well with any of my other lines. I am also excited to be adding a beautiful, orchid purple shade to this fabric line. You can just get a glimpse of it below peeking out in the top left of the photo below. It pairs so well with the other warm shades. And, with the addition of purple, I have been enjoying working with a rainbow of color – and, oh how I love a fabric rainbow! See that diagonal gingham stripe there on the far right? It’s the perfect binding fabric. I always design some sort of stripe into every fabric line because I love a striped binding. Another fun addition to this line is the Sunny Panel. The panel features 8 different motifs and measures 24″ x 44″. The motifs are the perfect jumping off point for pillows, bags, quilts, aprons….you name it! I love it so much I designed this Sunny Sampler – it uses the Sunnyside Up panel, two charm packs, five 1/8-yard pieces, 2 yards of background, and 1 yard of the gray gingham stripe. The quilt measures 57″ x 69″ finished. It’s also available as a kit from Moda. This is Delighted – I machine-appliquéd the scrappy leaves onto a dark background. The leaves were all cut from one Sunnyside Up Layer Cake. Hello Friend! That gray gingham stripe – it might be my favorite stripe ever. 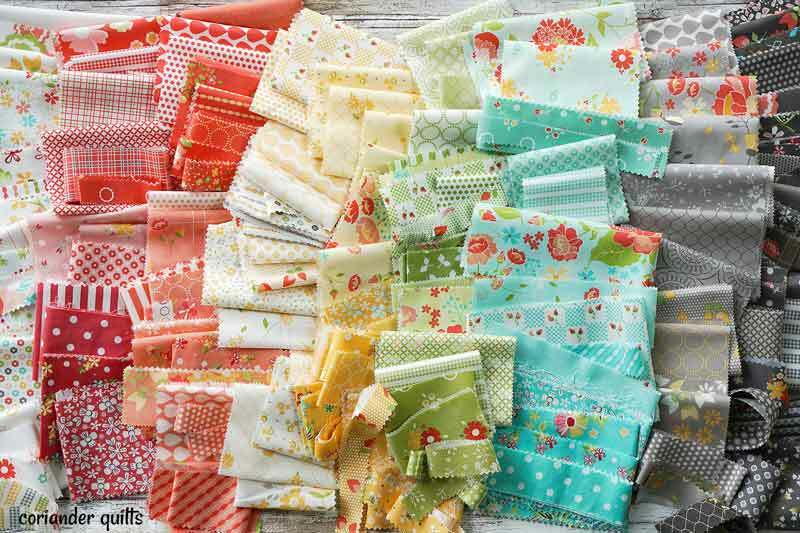 Hello Friend uses 12 Fat Quarters and it measures 54″ x 71″. I use a lot of Bella Solids in my quilts and these are the color numbers for the solids that work with Sunnyside Up. 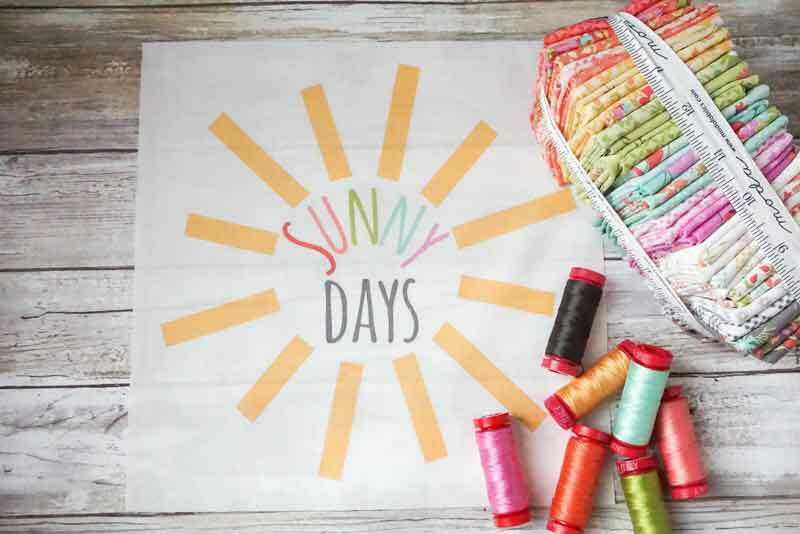 If you have purchased my Aurifil Sunny Stitches 12wt. thread collection, it coordinates perfectly with Sunnyside Up. And, I’ll let you in on a secret…those panels I mentioned above are beautiful as the centerpiece of a hand-quilted pillow. These 12wt. threads can also be used for machine-quilting – regular or with a Sashiko machine. 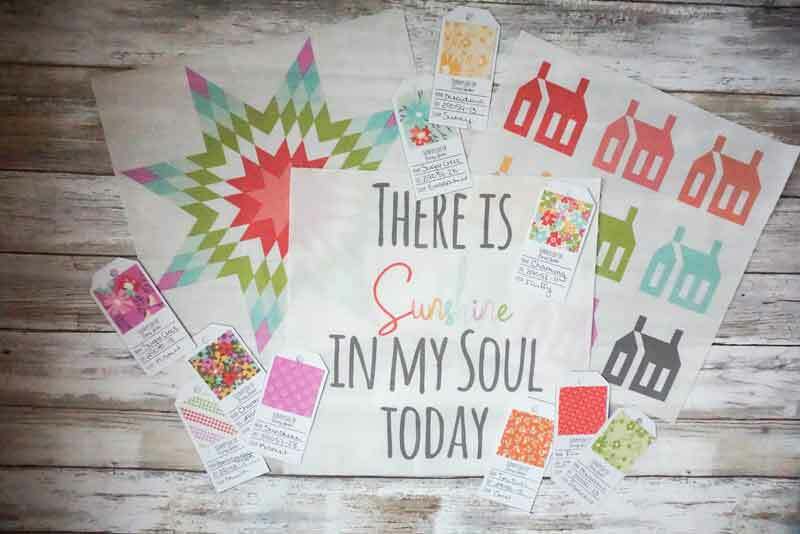 And if that isn’t enough, there are also some beautiful products designed with Sunnyside Up. The Mini Notes are so much fun, and perfect for jotting down quilt ideas. The set of pencil boxes are perfect for organizing my sewing supplies. 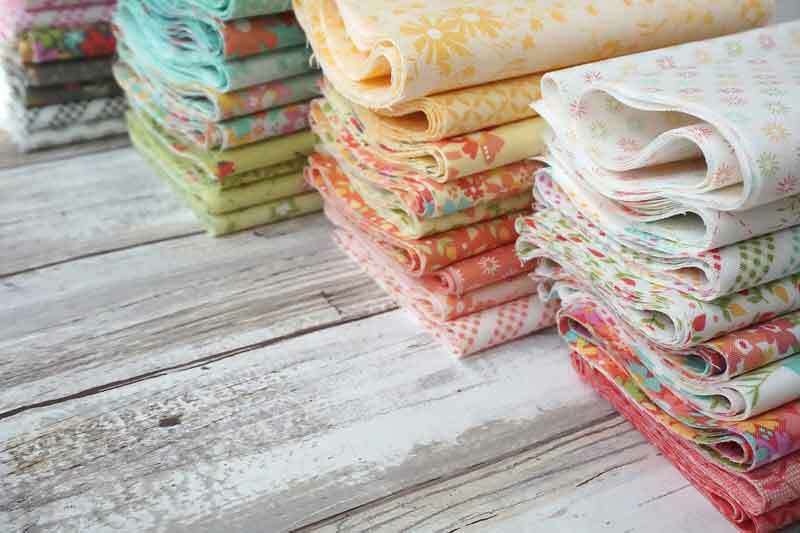 Sunnyside Up fabrics and patterns are in shops now. I’ll be back soon to share Strawberry Jam, my newest collection for Moda. It will be in shops next Spring… along with two other Moda collections that I’ve mixed with it. The way that little “good” bit fell in the center of my snippets tickled me so. By Carrie NelsonIn Books and Patterns, Fabrics, NotionsTagged Aurifil, Corey Yoder, Coriander Quilts, Sunnyside Up15 Comments on Sunnyside Up! Previous Previous post: What’s on Your Holiday Wish List? I love seeing your new line and it’s gorgeous! I really like how you can mix and match it with other fabric lines as well. Fun to see it along with your patterns too. Thanks so much! So fun thank you for sharing with us. I do so love your fabric lines. They do make me happy, which is what we need more of today. I also like that I can mix your fabrics from line to line, that makes me, HAPPY! Corey, your fabrics are always so joyful and this one is just full of joy. I like how you’ve coordinated it with fun little goodies too. Excited to use that adorable gingham stripe – I think that’s going to be a favorite “go-to” very soon. OH YAY!!! Enjoyed this post so much! These fabrics are just beautiful. 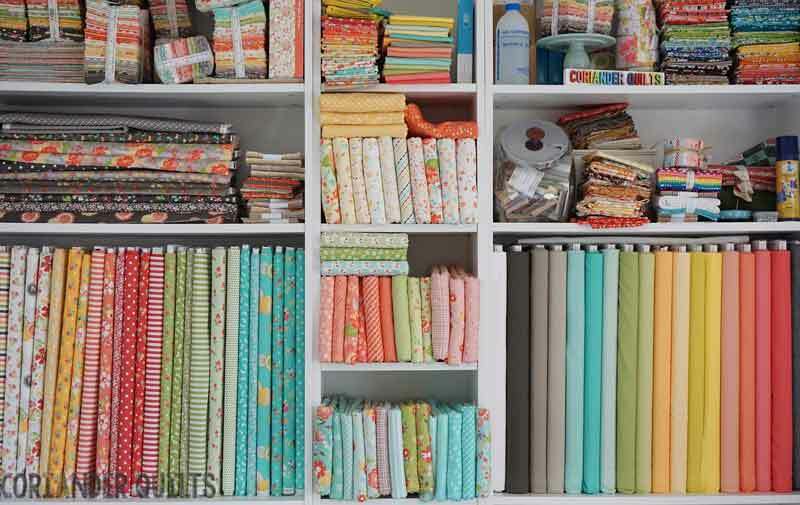 I especially like that you shared which solids match this fabric line! That is the most helpful thing when shopping on line! Is there any chance this could become a regular feature? Those pictures started my morning off right! I have a bunch of that fabric on my cutting table ready for Delighted. Corey, I hope you are using those scraps to make Carries pincushions! Thank you for such happy fabric! I love the collection. I made a quilt with Sundrops because the colors are gorgeous. The same with Sunny Side Up. Thank you for being specific about the coordinating solids. I had to do some digging to find the colors you had mentioned for Sundrops, but I was successful in the end!!! I’d definitely a Corey Yoder fan. What a lovely post Corey!! I’m using charm packs from 3 of your lines for my Kingfisher EPP quilt… I may need to add some sunny bits from this line too! Love the diagonal stripes!!! I love your new Sunny Side Up line and hope to use it soon! The colors and patterns truly evoke memories of carefree warm summer days for me! I love stripes for the binding the diagonal striped fabric you designed is perfect! Thanks! Love the addition of orchid! I became a Yoderer in the last year. I am always drawn to the colors you design in your fabrics. There’s so much gloom in the world, we need to surround ourselves with happy colors. Thank you for your lighting the world with your fabric. Expecting a new grand baby in 2019, and it looks like this may be my fabric for making a special quilt from grandma. This collection makes me smile! It’s a great way to keep happy during a long NH winter.